Alex Jones is the center of a great Jewish book burning, in a way which would make Nazi envious. Just flip a switch and your entire historical collection of work vanishes. Gone forever. Amazon alone could erase much of human intellectual thought if it so desired. History itself can now be wiped off the face of the Earth by a handful of individuals. As this highly lucent blogger professionally points out, the answer to Internet censorship is not to build your own website, that Mastercard, Paypal and the now, thanks to Obama, the UN-controlled Internet Domain Registrar can shut down everything you have spent years building. Jones was pushed back into the spotlight when Facebook, Apple, YouTube and Spotify all colluded to simultaneously ban Alex Jones from their platforms. Just like that, the entire social media presence, he had spent years building, the social media presence that his business largely depended on, was taken away overnight. This case and the de-platforming of other right-wing content creators and authors from a variety of social media utilities and payment processors has sparked a national conversation about the rights of corporations and the rights of individuals to access the public square of the 21st century. You can watch my video where I outline my more extended thoughts on this issue. I’ll link it below. In that video, I make the argument that simply saying that the free market will solve everything is not sufficient. In today’s censorship climate it is simply impossible to build free market alternatives to Big Tech platforms and have them be financially viable. For example, take a look at Free Serve, MakerSupport, or GoyFundMe. All three were free market crown funding alternatives that attempted to break Big Tech stranglehold on the crowd funding market. They did what the conservatives like National Review told them to. They built their own and what happened. They were deplatformed by their card processing company. Making them unable to process payments, effectively shutting down their service. It’s the same thing that happened to BitChute recently as well. “Well, start your own website and collect payments there”, people will say. Sure, you could do that, until Mastercard, yes Mastercard, comes in and cuts off your account. Build you own website is no longer sufficient. At the rate things are going, anyone to the right of President Trump is going to have to build their own domain registrar, build their own web server, payment processor, and financial institutions, simply to express their political viewpoints online. The fact is that Google, Facebook and Twitter all have effective monopolies on different segments of Internet communications. YouTube is a defacto video sharing monopoly. Twitter is a defacto microblogging monopoly. And Facebook is a social network monopoly. Their market share is so large that they absolutely constitute monopolies. And when they begin censoring people based upon the content of their political speech, as they already have done, that constitutes a grave threat to the American free discourse. Anyone paying attention can tell you this is happening. And the rational is pretty transparent. 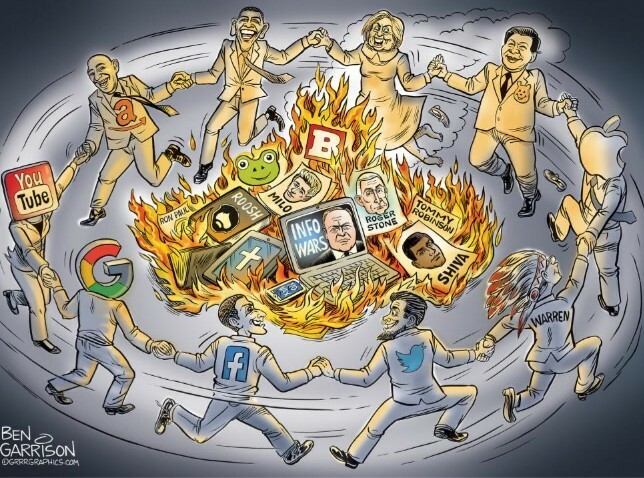 Big Tech wants to make sure 2016, the populist election of Donald Trump and triumph of alternative media over legacy media, can never happen again. That’s why the censorship is ratcheting up ahead of the 2018 mid-terms and 2020 presidential elections. Before we get into the Marco-Jones confrontation, let’s establish the fact that Marco Rubio may be a Judeo-loving communist liar, parading as a Republican. Marco is so bad, I refuse to even call him a RINO. From his own mouth, Marco shows his true political colors when he says that the Obama administration did nothing wrong when SPYING on the Trump campaign for the Hillary campaign. No Watergate to see here, so let’s MOVEON.org. Again, from his own mouth. Marco says that his parents escaped Cuba after Castro came to power. This is entirely misleading and backwards. The truth is that his grandparents brought his mother to America in 1956, 4 years before Castro came to power. I vote for C) because Marco’s mother went back to Castro’s Cuba 4 times where there was plenty of communist corruption and no economic opportunity at all, but Baptista’s capitalism was certainly long gone. Sure, his mother came to America after Castro’s dictatorship, but certainly not because she had any problems with Castro. The Marco family are Communists and that makes Marco Rubio a Liar! All this is to show that Alex Jones has Marco’s number, and that is why Jones confounded Marco outside the Senatorial offices. The confrontation at the Senatorial offices was very revealing of the type of mouse Marco is. Marco feigned total ignorance of who Alex Jones was. Seriously do I have a First Amendment? Because they are lying about me and trying to deplatform me. 26 companies working in concert, violating the Sherman anti-trust act. Now Senator Warner and Senator Wyden have said there are thousands of sites worst than Alex Jones. So, we’re becoming like Cuba, we’re becoming like Vietnam, we’re becoming like China. So regardless what people think about me or the straw men, should I have a First Amendment, or should these companies be able to violate the whole safe harbor act and all that and ban conservatives enmass. I don’t know anything about your site. Yeh, I support the First Amendment. I just asked questions about it. Yeh I know, it was only about China. Are you aware of the deplatforming going on? My broader concern is that, ah, what we are trying to do is preventing foreign interference in our elections. That technology could be used by authoritarian governments to argue we want you to do the same thing against people that are in our country operating. For example, for them, misinformation would be something like truth. For them, sowing instability would be supporting Democracy. He’s not answering. The Republicans are acting like it’s not happening. Thank goodness Trump is. Oh, there’s no purge of conservatives? No shadow banning of members of Congress? Now, Marco could be a seriously ignorant Senator concerning the guy at the center of this media censorship firestorm, or Marco could be LYING. Since we have already established the fact that Marco as a proven LIAR, then I choose that he is Lying. Now, if he had not known Alex Jones before, while all the reporters were saying they knew him, an open-minded Senator should want to dig deep for the truth and would have heard him out. But no, Marco Rubio is not one to be swayed by facts likely to change his narrative. America dodged a bullet by not electing this Jewish puppet who cares more for Israel and communists in his home Cuba and China than for the United States. From his narrative in this confrontation, you know his “Republican” vote will be to keep all government regulation off the Democrat Internet giant monopolies in the hands of the Democrat Party as shown in the hour-long Google Democrat fan-boy TGIF meeting where they conspired to double-down in throwing the next election, as they thought they had thrown it last time.